Changing climate has left its fingerprints all across Mars, and one of the striking locations lies in northern Syrtis Major. This is at the boundary where the highlands drop about 3,500 meters (11,500 feet) to merge into the vast northern lowlands. 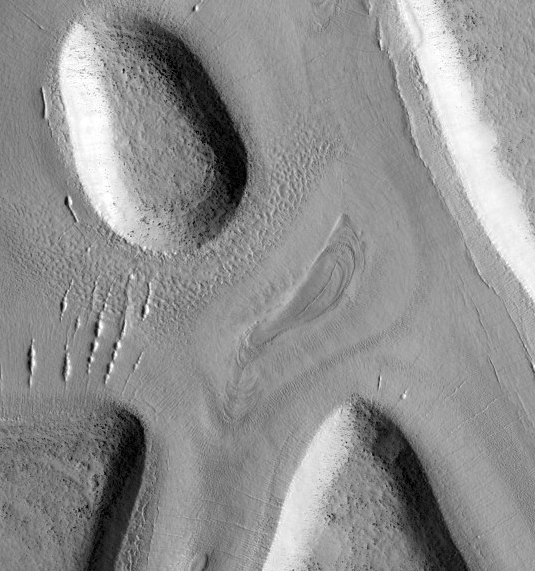 The origin of this boundary (which encircles all of Mars) remains disputed, but many landscape features in the transition zone reflect underground ice, both past and present. The region seen here shows where the disappearance of subsurface ice and permafrost has caused the ground to collapse, leaving blocky mesas and a few isolated buttes separated by broad, flat-floored valleys. Virtually every feature visible here owes its appearance to the effects of ice. Studies have found that during the last several million years at a minimum, Mars has experienced numerous ice ages. The most recent lasted from 2.1 million years ago until about 400,000 years ago. What drives such changes are cyclical fluctuations in the planet's orbit and especially the tilt of its axis, which can vary by tens of degrees. When the Martian poles tip more directly toward the Sun, the ice caps grow warmer and yield up water vapor to the atmosphere. At the same time, the mid-latitudes become colder and water vapor accumulates there as snow, migrating eventually into the subsurface to become groundwater and ground ice. When the climatic pendulum swings back, warming temperatures in the mid-latitudes pull water and ice out of the ground and return it to the atmosphere. It then collects as snow and ice at the poles once more. While scientists cannot predict exactly the comings and goings of ice ages farther back than about 20 million years, calculations show these climate changes have persisted for throughout Martian history. The mosaic image above comes from the Thermal Emission Imaging System (THEMIS), a multi-band visible and infrared camera on NASA's Mars Odyssey orbiter. The mosaic shows features as small as 19 meters (60 feet) wide. The ground in the mosaic and indeed across much of the region looks soft and indistinct, which is no illusion. Images taken from orbit show a blanketing layer across the tops of the mesas as well as the high ground to the left in the small image adjacent. High resolution images reveal that this layer has a stippled surface. It is covered in small shallow pits, each 10 to 20 meters (33 to 66 feet) across and only a few meters deep. Which raises a natural question, what's this material made of? Scientists think it is a blanket of dust or soil cemented with water ice and deposited when the last ice age was at maximum. (Imagine what a dust storm combined with a blizzard would leave behind.) By now, however, some of the water ice has sublimated out of this material, leaving shallow pock marks. In addition to creating pits, the disappearance of the subsurface ice "cement" may have destabilized the ground in places. Here it appears that something triggered a collapse that slid off the higher ground to the left. Readings by the laser altimeter on NASA's Mars Global Surveyor show that the topographic relief between the high ground and the valleys between the mesas is not great — 50 to 100 meters (160 to 330 feet). Yet based on terrestrial examples, this is probably enough for an avalanche or a debris slide. What triggered the collapse? Hard to say. Perhaps on a local scale, the slope became too steep to stand without the support of ground ice. Or perhaps an earthquake or seismic shaking from a meteorite impact started the collapse. The disappearance of ground ice on Mars has left a curious landscape that scientists call fretted terrain. First identified in the early 1970s, fretted terrain is found along the boundary between the lowlands and highlands in northern Arabia and this region as well. Recent results from the SHARAD instrument, a ground-penetrating radar, on NASA's Mars Reconnaissance Orbiter paint a picture of valleys filled with ice under an insulating cover of rock and debris. Fretted-terrain valleys have flat floors with steep walls that typically rise a thousand meters (3,300 feet) or more. Some valleys meander like stream valleys on Earth, others (such as here) run straighter, and some form closed depressions. The oval butte in this close-up image is about 1 km (half a mile) long and 20 meters (66 feet) high. The mesa tops stand about 30 meters (100 feet) above the valley floor. In the zoom-in (see red box and upper right), aligned pits in the surface at left show where the surface collapsed as cracks opened in the ice making crevasses like those found in terrestrial glaciers. Elsewhere, stippled surfaces show small shallow pits caused by the sublimation of ice. And the valley floor displays lines that may indicate flowing ice (as with a glacier) or where ice has crept out from the valley walls. While some valleys, such as Mamers Vallis, show clear-cut flow lines, the valleys here however suggest that the subsurface ice has remained relatively stagnant. Another characteristic of ice-rich ground in the fretted terrain regions is what scientists call terrain softening. This crater, which spans 1.2 km (4,000 ft) by 25 meters (90 ft) deep, is a perfect example. Impact craters that form in dry target rock have sharply defined rims and distinct features. But those that form in terrain that contains a lot of subsurface ice — such as this one — will become modified as the ice melts or vaporizes. The result will be a general slumping of features that makes them less distinct. Lines of pit craters mark the locations of crevasses in the ice that fills the valleys between the mesas and buttes. This scene, about 2 kilometers wide, is part of frame PSP_007793_2180, taken by the HiRISE camera on NASA's Mars Reconnaissance Orbiter.